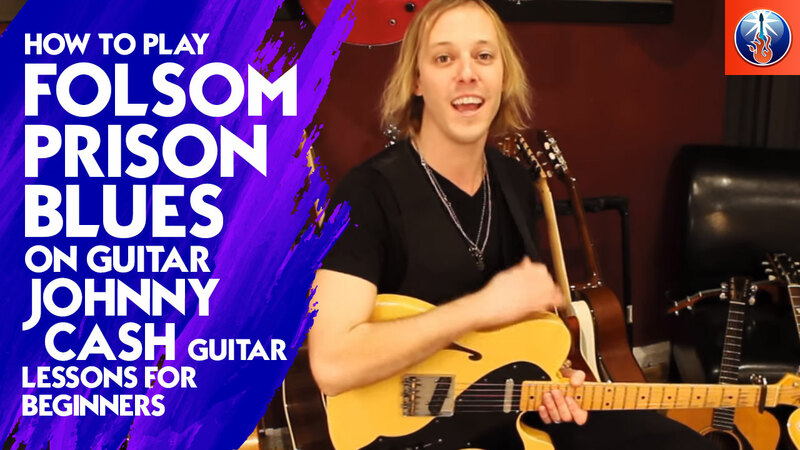 In this Guitar control lesson video, Instructor John Maclennan is going to give you an introduction in how to play the Folsom Prison Blues on guitar! A classic Johnny Cash song. He is using a capo on the 1st fret using the chords E, A, and B7. If you don’t have a capo that’s ok, you can still play this song, it will just be in a different key. Would only probably bother you if you tried to play along with the recording or sing it. So let’s check this riff out and John will break down a basic country pattern for you played in the style of legend, Johnny Cash. Step one in learning how to play the Folsom Prison Blues on guitar how to use a capo. For this song there is a capo on the 1st fret. Capos act as a finger does when it barres a string, putting pressure down. When we use a capo we don’t have to use our finger and it allows us to play chords we couldn’t play without and makes the chords much simpler as you are getting to play open chords instead of barring. When we say we are using E, A, and B7, the capo changes the name of these, but we just call them these chords cause that’s what they are in the open position. So in the key of E, but concert F. Also when using a capo it basically cuts off any of the frets behind it. So when John says 1st fret, it means relative to the capo. So the capo is now almost like the nut of the guitar. So starting out on the 5th string 2nd fret with our second finger we are going to pick this note three times. Then we are going to place your pointer finger on the 4th string 1st fret and pick this note twice, then back to the 5th string 2nd fret once with your middle finger, and back to the 4th string 1st fret with your pointer one more time. And then reach down to the 6th string 2nd fret, pick it once and pull it down slightly giving it a half step bend, then picking the 6th string open and now you are on an E chord. This is basically an intro that is built off of the five chord, the B7. A fill B7 is played with your middle finger on the B note on the 5th string 2nd fret, your pointer finger on the 4th string 1st fret, your ring finger on the 3rd string 2nd fret, an open 2nd string, and your pinky on the 1st string 2nd fret. Strumming from the 5th string down through the 1st string. If you are enjoying learning this classic Johnny Cash riff, also be sure to check out how to play the intro to Sweet Home Alabama for another classic tune to add to your repertoire. After that intro riff, you are going to play an E chord but the way its played it what makes it so cool. To play an open E major chord you place your middle finger on the 5th string 2nd fret, your ring finger right under it on the 4th string 2nd fret, and your pointer finger on the 3rd string 1st fret and strum from the 6th string all the way down through the 1st. So first playing the 6th string, the root note, then playing the 2nd fret 4th string, which is also the root. Then play the 5th string which you are of course holding down the 2nd fret of with your middle finger because you are still holding the shape, and then go back to the 4th string where you are holding down the 2nd fret with your ring finger. Then you are going to alternate between these two patterns over and over. So 6th, 4th, 5th, 4th and repeat. Then we are going to do the same thing on the A7. To play an A7 place your pointer finger on the 4th string 2nd fret and your ring finger on the 2nd string 2nd fret. Strum from the 5th string all the way through the 1st and that is what an open A7 sounds like, but for this riff we are not strumming it, we’re arpeggiating, which means we are holding down the chord shape but we are picking only one note at a time in a pattern. So just like we did for the E we are doing the same thing now on the A7. So holding down the A7 shape the whole time and they I will just say which strings to arpeggiate, while holding it down. So first go to the open 5th string, then the 4th string, then to the open 6th string, back to the 4th string. Alternating between these two patterns, and every other note is the 4th string 2nd fret. Then go back down to E, and play it the same way we did the first time, then we are going to go to B7. For B7 make the B7 shape we talked about, starting with the 5th string that you are holding down the 2nd fret with with your middle finger, then kinda pick the rest of the string but focusing really on the 4th string. So either pick the 4ths tring only or the chord from the 4th string down. Then move your middle finger up from the 5th string 2nd fret, to the 6th string 2nd fret, the back to picking the 4th string. Alternating now between these two patterns, then back home to E! Right before you go back to E, on the last time alternating patterns on the B7, so the last time you are playing the 6th string 2nd fret, giving this note a little pull, so a slight bend, taking you right back into E. Follow along with John atthe 2:43 mark to hear him play the whole thing from the top. Rhythmically John is really palm muting this riff heavily, laying his strumming hand down where the bridge and the strings come together on the guitar. Just really dampening the strings. Giving a very staccato sound, not a big ringing out chords sound. He is also using a little slapback delay which is really common when playing country or rockabilly style guitar, it’s just kind of part of the sound of these genres. I hope you enjoyed learning how to play the Folsom Prison Blues on guitar! 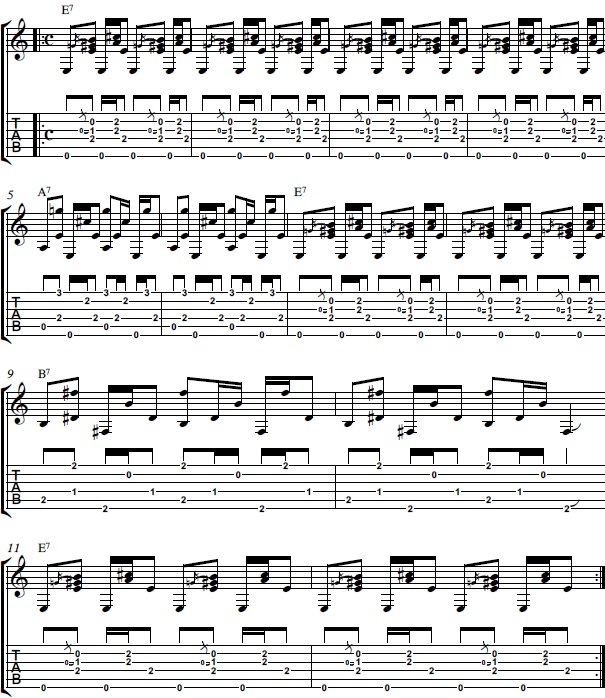 This song is just so fun to play and the riff itself is very upbeat sounding. Remember you don’t have to be so specific on that rhythm part, just as long as you’re alternating the bass note, you can either pick the single string after or strum part of the chord voicings, which are the ones that come in on the ands. We change the bass notes on the downbeat and do the chord hit on the ands. So the bass note changes back and forth between the two on every other down beat but playing a bass note on every down beat, and on every up you are playing the chord voicing of which ever chord you are on, almost like a strum. Totally up to you, you can strictly use only one note for each hit, or add the chord voicings in for the ands. Either way this is a fun, unique, but simple riff that hopefully opens your eyes on how to make simple chords more exciting. Be sure to practice this riff slowly first before you speed it up, and of course, as always, have fun!